Any child would tell you that a glow in the dark party would be totally awesome! I mean who wouldn’t love this as their birthday party theme, especially tweens and teens! It’s the perfect party theme for older kids and there are so many awesome ideas you can incorporate into this these! 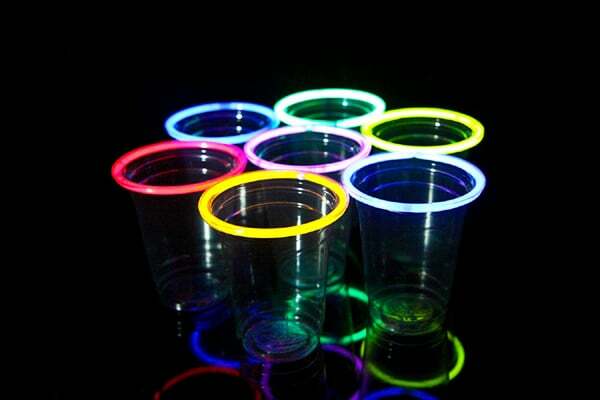 Here are 20 Epic Glow In The Dark Party Ideas that will set your party apart from the rest! An epic glow in the dark party would include an awesome glowing dessert table, table centerpieces, lighting, backdrop, drinks, cakes, cupcakes, and more! Below are some amazing ideas that will really WOW your child’s friends! 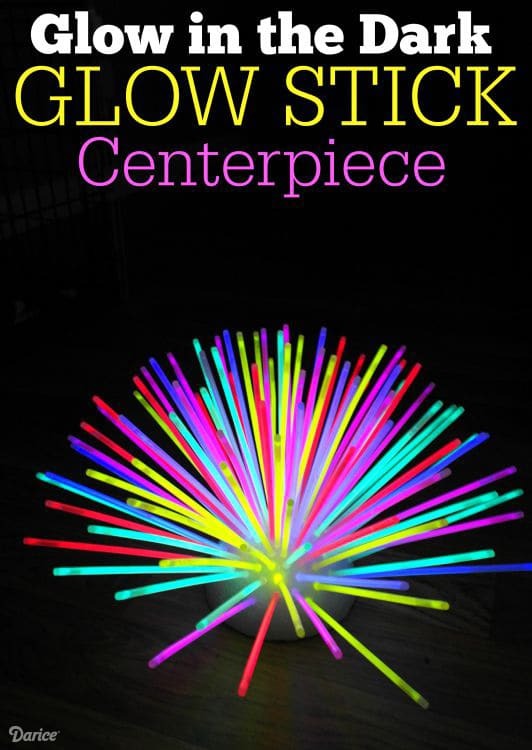 All you need for this DIY Glow in the Dark Centerpiece is a foam ball and some glow sticks. How awesome would this be for summer outdoor entertaining on your deck? LOVE it! Did you know that anything with B2 vitamins will glow in the dark? 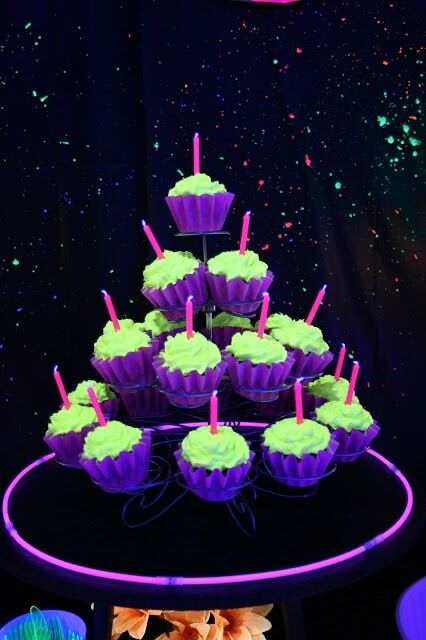 Yep, grab the recipe for these Glow in the Dark Cupcakes for your party! The kids will love them! Add a little tonic water to your jello and get Glow in the Dark Jello! 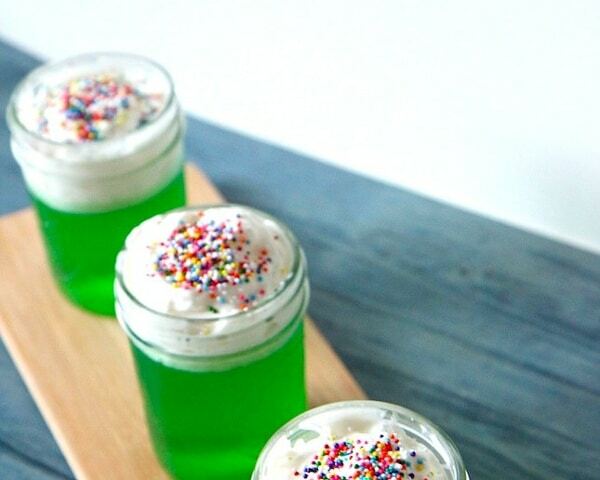 This is the perfect treat to add to your party dessert table! 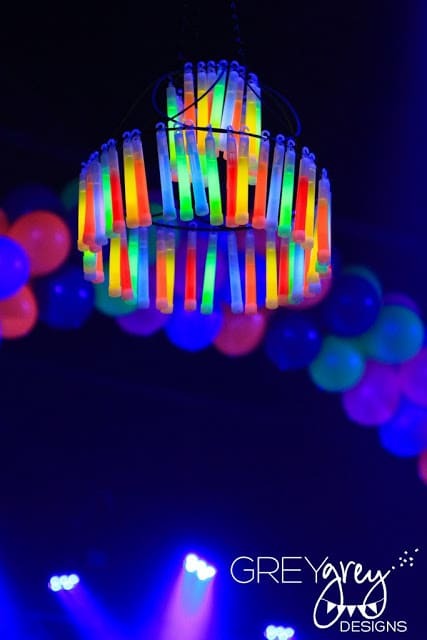 How fun and creative is this DIY Glow in the Dark Chandelier?! A couple of these hanging around your party space will really add to this already fun theme! 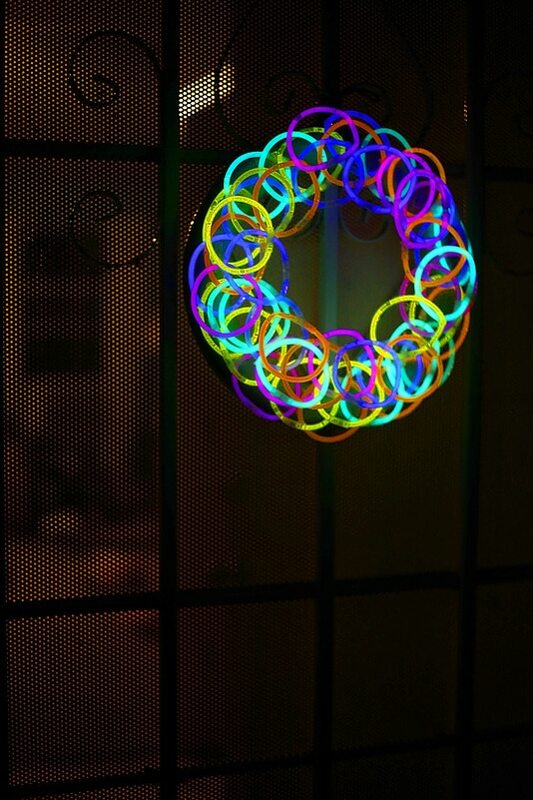 Grab some glow bracelets and a foam wreath and make yourself a DIY Glow Stick Wreath! This wreath would also be perfect for Halloween night! We just love the fun colors and cool dimensions of this DIY Neon Bowl Party Backdrop! What a creative party backdrop that will definitely be the focal point of the entire party! If your party venue has ceiling fans, you can incorporate those fans and some glow in the dark sticks into your party decor! For this Glow in the Dark Ceiling Fan Idea, just attach glow in the dark sticks to your ceiling fan and turn your fan on for a fun light show! 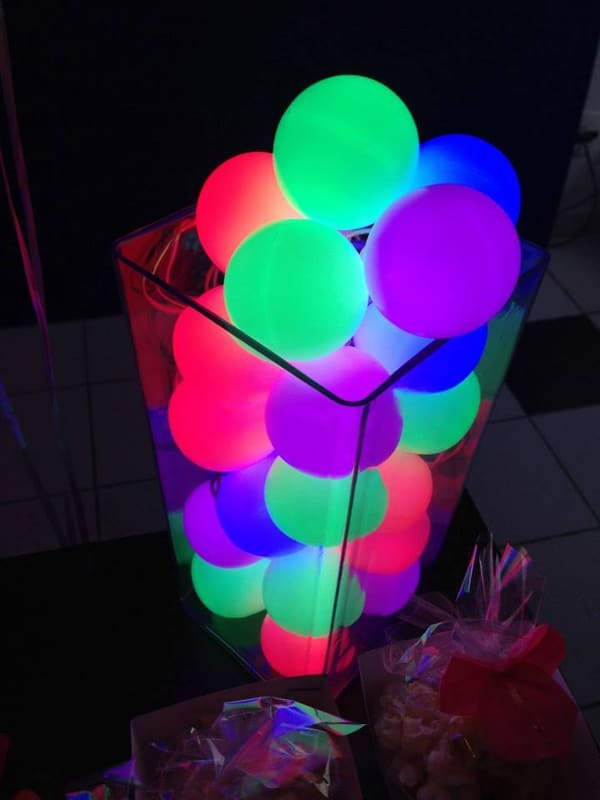 Glow in the Dark Balloon Party Decor can be used for a number of things. We love this idea for a fun and easy table centerpiece. 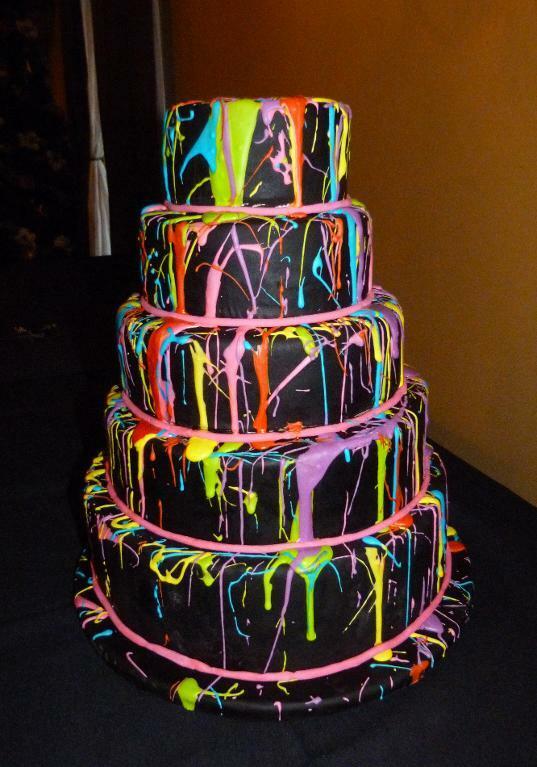 How awesome is this Neon Splatter Birthday Cake?! What tween or teen wouldn’t think that this is the coolest cake ever! Finding things that glow to add to your party tables like on this Neon Glow in the Dark Party Table make the party that much more fun! 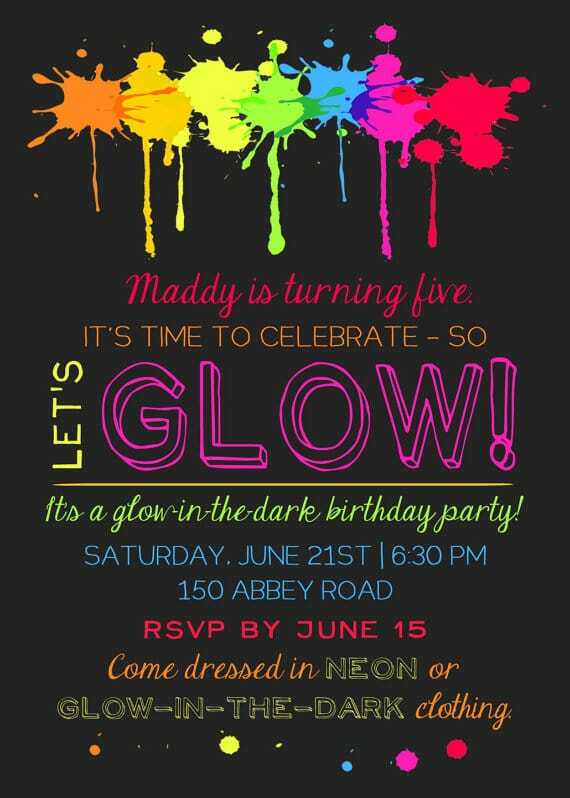 Your party theme starts with the invite and this Glow in the Dark Party Invitation is perfect for any glow in the dark birthday bash! 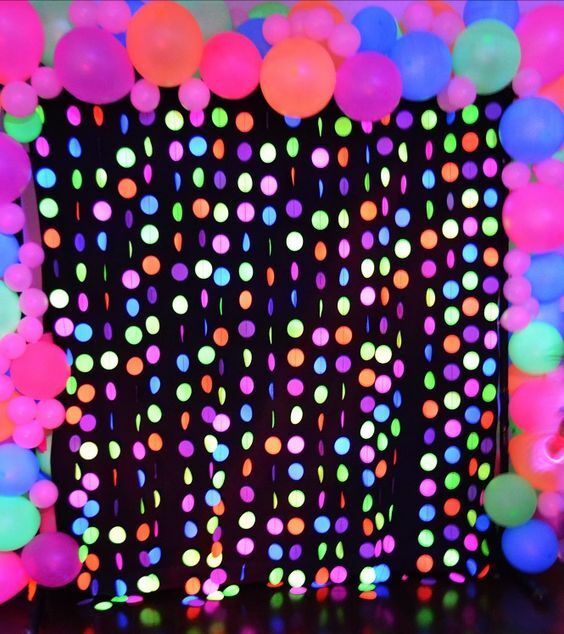 We’re totally in love with this Glow in the Dark Photo Booth Backdrop! This would also make the best party entrance too! 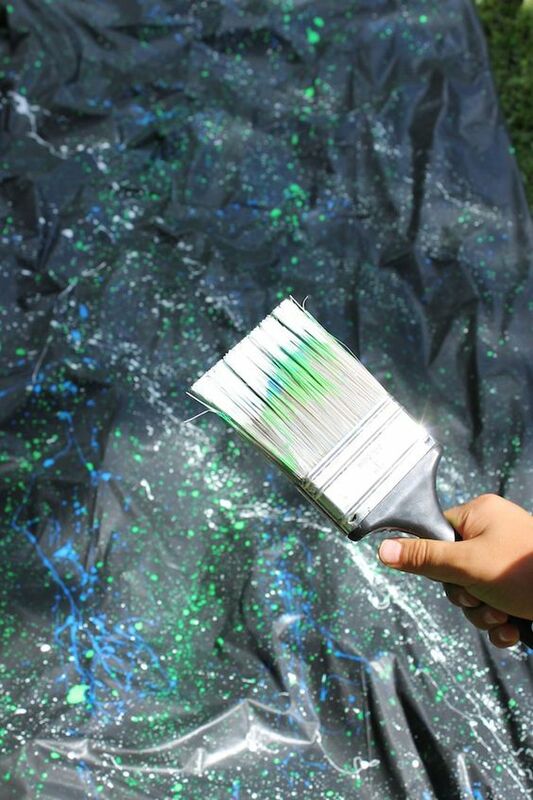 If you’re looking for a little fun DIY idea, check out this DIY Glow in the Dark Paint Splatter Table Cover! 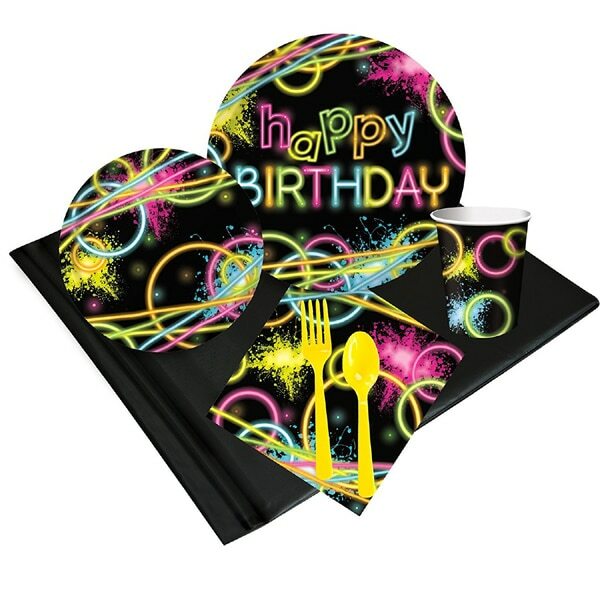 These cool table covers are sure to be a hit at the party! These Glow in the Dark Bubbles would make a great party favor or party activity depending on the age range of your party guests. Grab this Glow in the Dark Party Pack that will go perfectly with this theme! 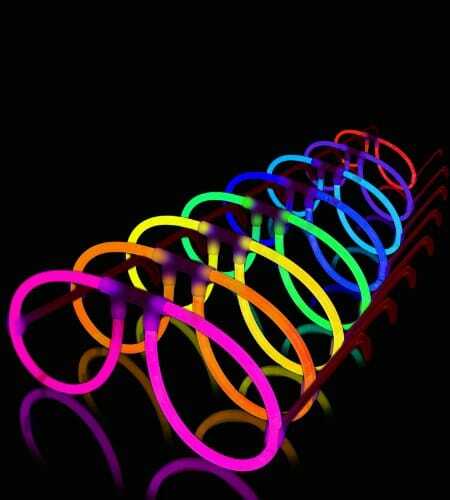 These super fun Glow in the Dark Glasses would make great party favors for the kids and I even bet they will be wearing them for some cool photo ops! 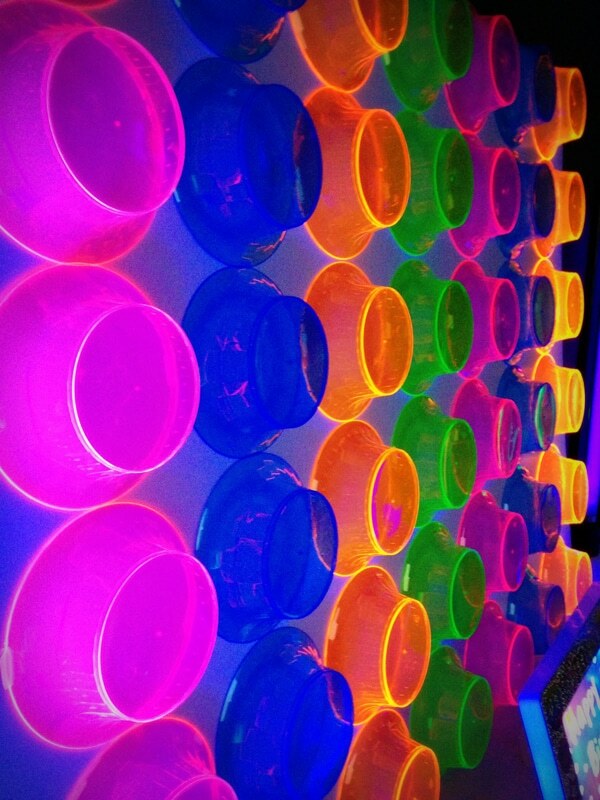 These Glow in the Dark Party Cups are a must-have for your neon glow party! 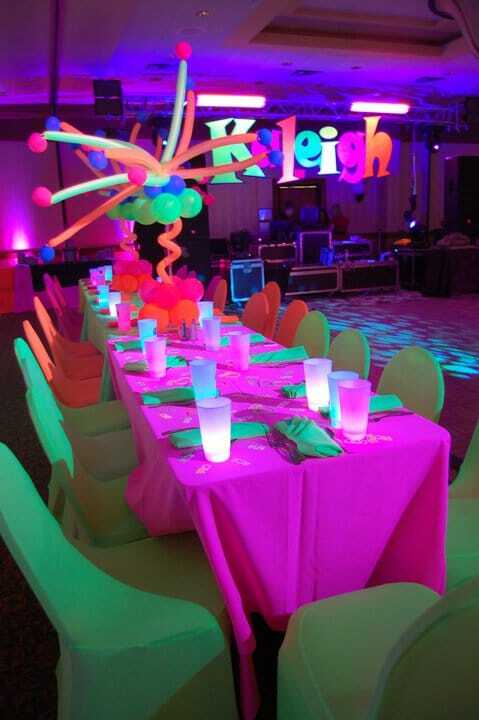 This fun and colorful Glow in the Dark Party featured jumbo letters spelling out the birthday girl’s name and funky glowing balloon centerpieces. This party has FUN written all over it! 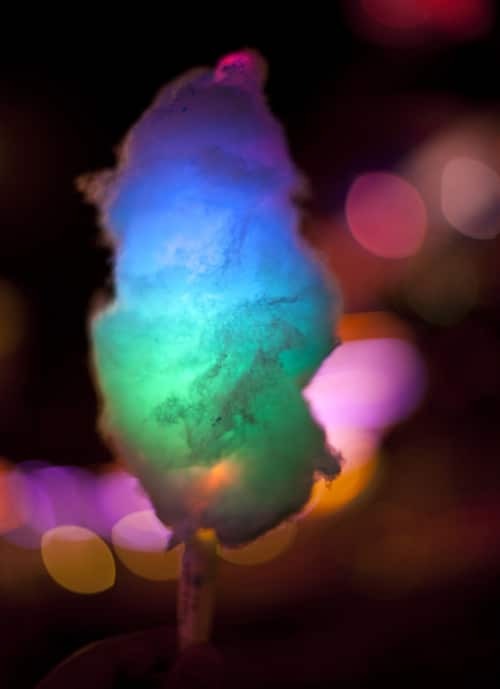 Why not offer your party guest Glow in the Dark Cotton Candy?! It’s fun, easy and everyone will love them! 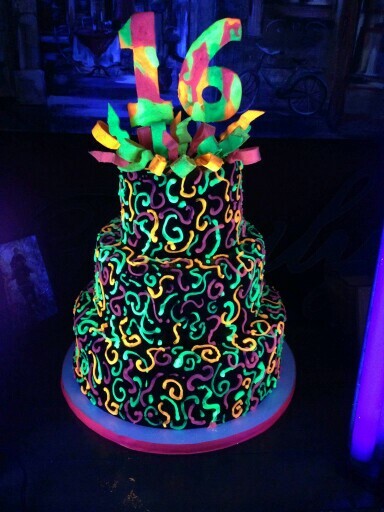 This Glow in the Dark Cake is perfect for that special 16th birthday party! I mean the cake definitely has to glow in the dark for this theme, right?! 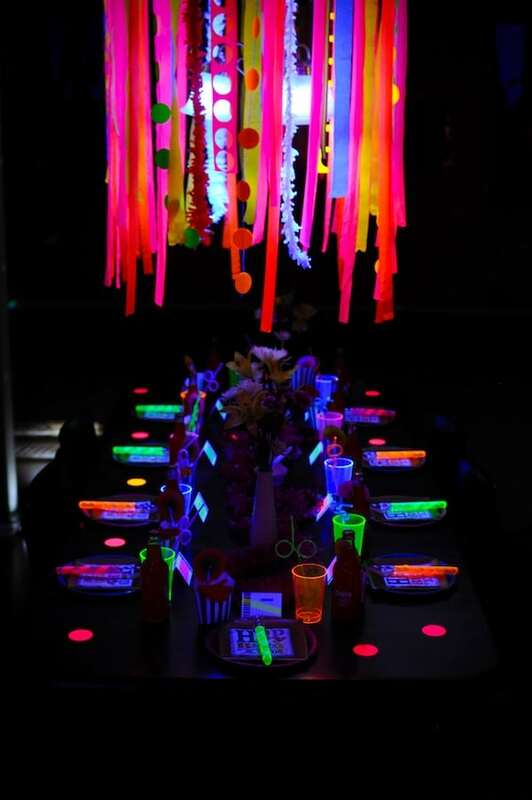 Which of these 20 Epic Glow in the Dark Party Ideas are your favorites? Let us know in the comments below. Looking for more party ideas? Don’t forget to follow us on Instagram @prettymyparty and Pinterest and join us in our private Facebook group. SOOOOOOOOOOOOOOOOOOOOO much help thank you!!!!!!!!!!! OMG. Thank you guys sooo much this is so helpful for my party this party will be the bomb with these decor ideas.